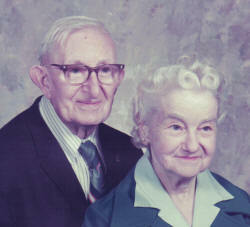 In the fall of 1970, Mr. and Mrs. A. W. Terry expressed their desire that their farm be used as a youth camp and that Rev. 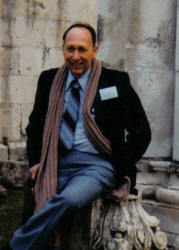 Gene Casey, pastor of Second Baptist Church, be the director. 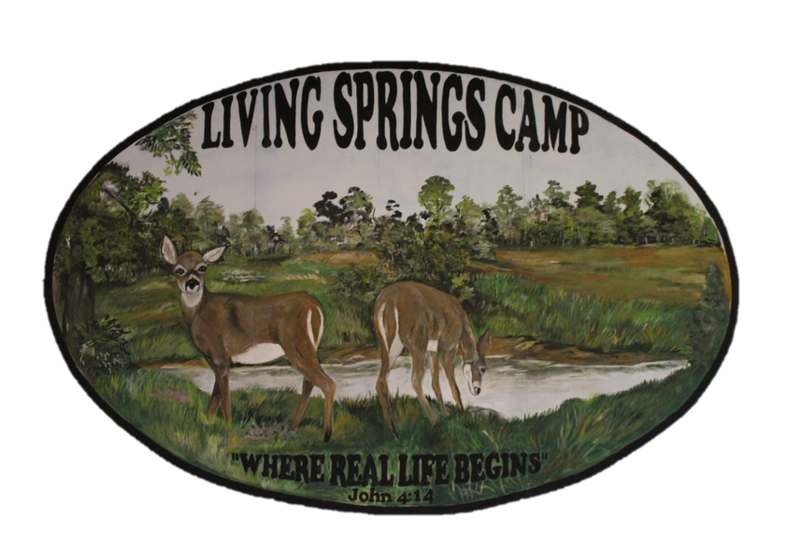 Since that moment, much planning and preparation made Living Springs Camp a miraculous reality. This camp is dedicated to providing Christian education, wholesome recreation, character development, fellowship, and inspiration to young people. The one-hundred acres of property bought by Mr. and Mrs. Terry in 1952, is located 12 miles south of Festus on Highway TT, having two ever-flowing springs, several seasonal springs, and a large log house which was built in 1912. Mr. Lee Bailey of Rush Tower, designed and engineered the building of the rustic five-bedroom log house for the Grosse family who resided in St. Louis and came here for the weekends. The house is built entirely from logs taken from the surrounding woodlands. 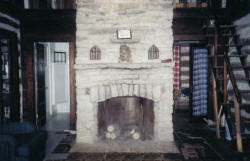 A huge native stone fireplace graces the spacious living room, which served as a meeting place and dining area for the campers during the first year of camp. The bedrooms and loft area served as sleeping quarters for the campers until cabins were built for the second year. A large 45 x 20 foot screened dining area was added to the log house the second year and overlooked the tree tops in the valley below. Until 2008, a small two-story log cabin sat beside a large flowing spring. The cabin was constructed sometime in the 1860s. It contained only two rooms, one upstairs and one downstairs and at one time housed a family of eleven. The first camping season was in 1971, with six weeks of camping involving 211 boys and girls. 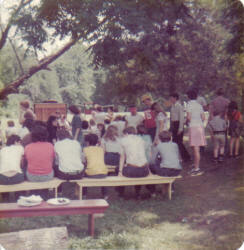 The camp program consisted of morning devotions before breakfast, classes in the morning, and inspirational services in the afternoon and evenings. Services were held under a huge oak tree beside the spring. Recreation of hiking, horseback riding, softball, volleyball, swimming, and archery was enjoyed by the campers. Each night after the service, there was a ‘fun time’ which varied from stunts to talent shows, campfires, etc. There was also a canteen where the children could purchase refreshments at specified times during the day. Three complete meals were served each day and were prepared by five groups of ladies. Meals were served family style. 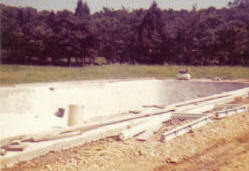 During the summer of 1973, Missionary Gerald Pieper from Guadalajara, Mexico donated his time and spent several weeks along with men from Second Baptist Church to build an approximately 25 x 50 foot in ground swimming pool for Living Springs Camp. The campers had formerly swam in the DuBois Creek that runs through the campground. For almost fifty years, Living Springs Camp has never stopped improving. Eighty additional acres of forested hills and glades was purchased in 1995. Our obstacle course and trails can be found there. As the lodge got older, the girls needed new accommodations. Two new dormitories were constructed in 2011, as well as a multipurpose administration building near the spring. The waterslide, an instant favorite for the young and the young at heart, was installed on one of our hillsides and has been extended each year. Many more exciting plans are being constructed for the future. Of course, all of these activities are designed with one purpose in mind: to encourage young people to set aside their normal distractions and draw closer to God. This is the purpose that Living Springs Camp was established for all those years ago, and by God's grace, this is what we will always do.